This cold weather/central heating combination is well and truly drying my skin. While switched up my usual face cream to heavier moisturiser, I've made sure that I've got a few moisture masks within my skincare drawer. Moisture masks are perfect for when your skin needs a big pick me up, they provide a good shot of instant hydration and sink well into the skin. They normally are designed to be used for 5-10 minutes, but all can be left overnight for extra effectiveness. After use, I find my face looks smoother, brighter, more refreshed and my makeup applies much more evenly. They are a godsend for people with dry skin, but I have oily skin so don't use them all year round. Although I have oily skin, I also suffer from really lacklustre looking dehydrated skin. I'm always careful not to use anything too heavy or scented on my face as it can trigger breakouts. All these mask's within this post are suitable for sensitive, spot prone skin and so far haven't broken me out. 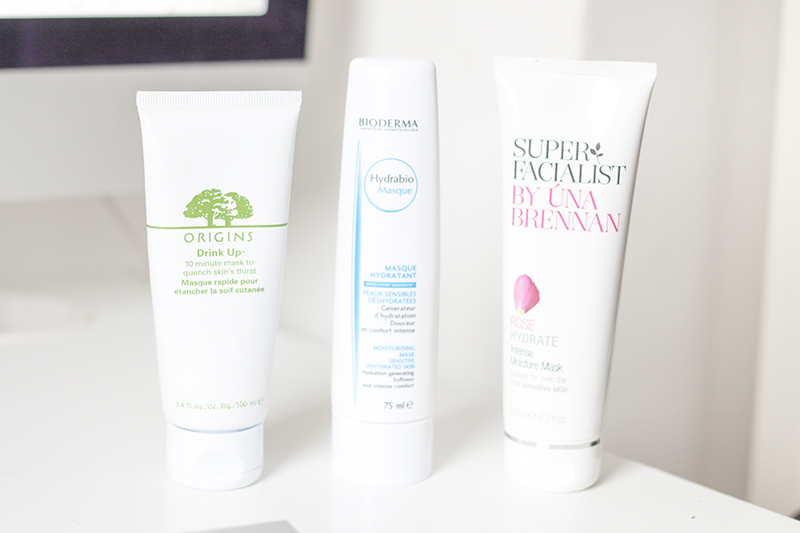 My pick of these three is the Bioderma Hydrabio Moisturising Mask. I find that the product not too heavy as it has a gel-cream type texture rather than super creamy. Its light on the skin and doesn't feel like my skin is being coated with product. It starts to absorb into the face really quickly and afar the 10 minutes I take a tissue and remove the excess. Although my skin literally drinks this up as I very rarely have much excess left on my face. After use, my skin is noticeably plumper and smoother. Other notable moisture masks are the Origins Drink Up Mask, an apricot/peachy cooling creamy mask. I like this mask as it is great at balancing out the drier areas of my face without making the oily areas worse. This was the richest in terms of consistency of the masks, plus the natural fruity scent didn't smell synthetic at all. I normally steer away from fruit fragranced products, but it hasn't broken me out. My drugstore pick for moisture mask is the Super Facialist by Una Brenna Intense Moisture Mask. It's a lot cheaper than the other two options and does a top job of moisturising the skin. I love the soothing scent of rose in this face mask. The product contains a mix of white willow extract, vitamin e, urea and marshmallow extract (interesting?) which work together to effectively plumps and hydrate the skin for a blast of natural radiance. Have you tried a moisture mask?